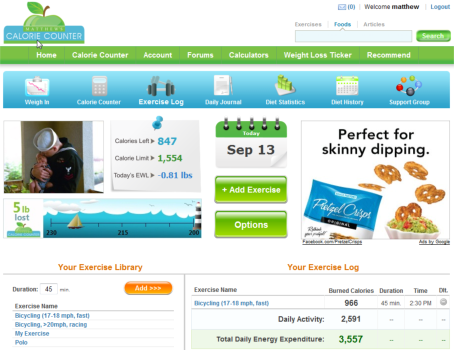 Your exercise log is used to keep track of your Total Daily Energy Expenditure (TDEE). Auto allows you to select an activity level that best matches your 'general' activity level. Your Total Daily Energy Expenditure will be calculated for you based on this activity level..
Manual gives you more control and a more accurate calculation of your TDEE, which in turns gives you a more accurate EWL projections, Daily EWL and EWL since your last weigh in. With your account set to MANUAL, your initial TDEE is based upon a Sedentary lifestyle. This number is called your "Daily Activity". Additional exercises must be added by you to generate your 'total' TDEE. Your personal exercise library is specially tailored for your daily activities. Add exercises manually or from our extensive exercise library. Your exercises will change as you do, dynamically adjusting their values to fit your own weight loss. This opens the door to many different possibilities, including the sharing of exercises between your other support group members (wife, husband, coworkers, work-out partner...).